Fantastic, professional restoration project car with no effort or expense spared. Clean, Solid all American steel car, Southern car, St. Louis MO. Fresh 350 V8 engine bored 30 over and Turbo 400 Automatic Transmission. (not installed). Completely ready for primer and paint. New floors, Inner and out rocker panels, flush filled firewall. Gene Smith tail lights, grill, park lights and hood bar. All new glass with new chrome on edges. 4 wheel disc brakes. Stainless A-arms. 4 coil over shocks. Stainless brake lines. Ford 9” rear end. Body tub’d 3” to hold 12” tires. New 18 gallon fuel tank. Also comes with original Front and rear seats and all trim and door handles. Rare station wagon rear bumper. Lots of extra parts goes with the car. Over 95k invested in this awesome restoration. 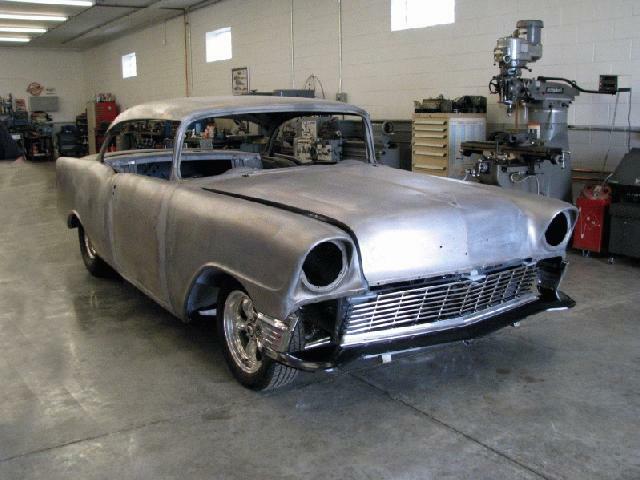 To see all the pictures of the 1956 Chevy BelAir Hardtop project car for sale by owner, Click Here!